Fishing in Marbella, a village situated on the Mediterranean coast between Málaga and the Straits of Gibraltar at the foot of the Sierra Blanca, is a huge tourist attraction for its warm Mediterranean climate and its 26 wonderful beaches, stretching 27.9km of coastline. With the diversity of species, fishing in Marbella is ideal for fishermen of all levels. 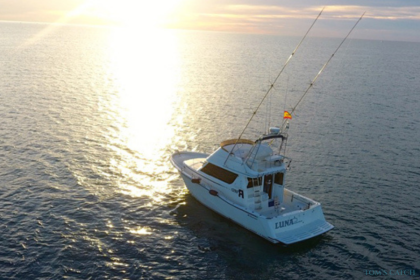 Fishing in Marbella is a pleasure for all fisherman, who can enjoy the four ports of the most iconic city of the Costa del Sol. 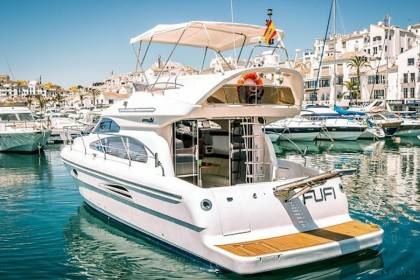 These ports are: Puerto Virgen del Carmen (located downtown near shops and the beach, offering a yacht club and a professional scuba diving school), Puerto Banus (a luxury port with 1000 moorings), Puerto Cabopino and Puerto Marina la Bajadilla. Pink Dentex: The pink dentex rocker (pagrus auriga) is usually quite large (90cm) and can weigh 11kg or more. Its colour is usually pink at the time of capture and gets more red later. Fishing of this species can be done between 2 and 200m deep in rocky or mixed areas of sand and rock. In order to fish this species, deep trolling is practiced with natural bait. You can fish practically all year round, but February and March are usually the best months to catch this species. Dentex: In Marbella, dentex can be found between 0 and 200m deep, with the young closer to the shore and the old out deeper. Dentex feed mainly on fish, crabs, molluscs and their favourite, squid. You can deep trolling with natural bait to catch them. You can fish dentex practically all year, although April and May are usually very good months to catch them. Red Tunas: Red tuna (thunnus thynnus), like bluefin tuna, is a fish of the scombridae family. It is a species that can weigh more than 500kg, making it one of the most prized species by the fishermen involved in fishing in Marbella. You can fish them with the trolling technique from April to August, though you can also catch them by chumming in July and August. Fishing tuna in Marbella is a highly spectacular activity, especially catching fish between 20 and 100kg by spinning. With this technique, is advisable to use stickbaits and quite large jigs. With the technique, you will be collecting irregularly, sometimes with jerks and stops. We recommend using a good reel (Saltiga 4500 or 6500 type or Stella Daiwa 18000-20000 Shimano, for example) and braided lines 60lb-80lb, because the combat with a bluefin tuna may extend for over an hour easily. Grouper: The grouper fish is perfectly camouflaged to the seabed of Marbella, so the best technique to catch it is with anchored trolling and natural bait. Grouper can be found all year round. Black Spot Sea Bream: The young bream are more coastal in shallow water and they swim grouped together. As their age increases, they live in deeper and sandy places. Fishing black spot sea bream in Marbella is done chiefly in winter, and in the seabed (which means between 200 and 400m deep). Spring: High trolling and spinning can be practiced from April and May. Using these techniques we can fish bluefin tuna, albacore and little tunny. Fishing by drifting or anchoring is possible at this time of the year to catch dentex, grouper or tunas. Summer: Marbella in summer is a good time to fish bluefin tuna by chumming. This technique can be done on the high seas about 30 miles from the coast. 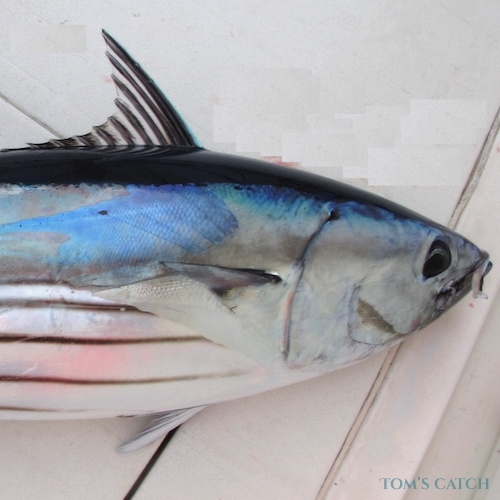 Bluefin tuna has to be fished by trolling with artificial baits because there are streams, which they do not allow fishing by chumming. 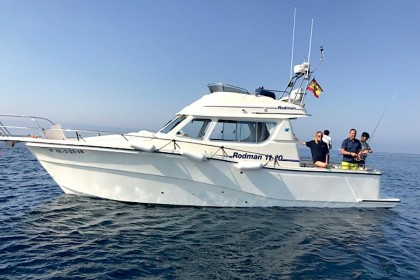 Near the coast, fishing in Marbella can be done by trolling with natural baits (squid, mackerel or jack mackerel) to catch dentex, pink dentex, grouper or amber Jack. Autumn: This is an excellent season for coastal trolling with small lures and feathers to fish various species such as bonito, mackerel, little tunny and dolphin fish among others. 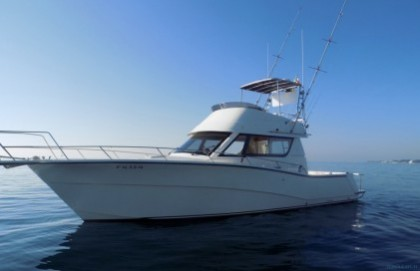 Winter: The winter is ideal for deep sea fishing and bottom fishing in Marbella. With large bottom fishing, you can find a wide range of species such as the largest bream, codling, conger eel, grouper, grouper and hake. February and March are usually very good months for fishing big pink dentex (capito) by deep trolling with natural bait. This technique can also catch mero, dentex and amber jack. All year long: In any season, deep sea fishing can be practiced. Nobody is a foreigner in Marbella. This cosmopolitan town, with all the charisma of a large city, is home to 137 nationalities. 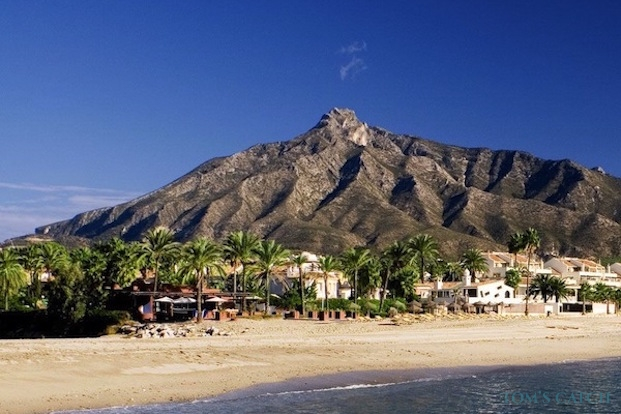 Marbella, one of the best places in the world to live, is famous for its internationally renowned and privileged climate. The annual average temperature is around 18.5º C, with 320 days of sunshine a year. Weather forecasts do not suggest any significant changes and the rain here does not usually exceed 50 days each year, December and January being the time of year with the highest precipitation. This climate is due to its unique geographical situation, namely the mountains which surround Marbella, the Sierra Blanca and the Concha, visible from the entire area. Allied to the position of its coastal inlet, the effect is to shelter the town from the northern winds, allowing it to enjoy a special microclimate unique in the world and one which has become one of its great tourist attractions. You need a fishing license to go fishing in Marbella and Puerto Banus. The fishing charters normally have the fishing license included in the price, so you don't need to buy one if you're chartering a boat.